This is a 40,000 megapixel, 280,000 x 140,000, 360 degree picture of the 868-year-old Strahov Monastery Library in Prague, Czech Republic. A lot of numbers, right? Here's more: the gigantic picture is actually made up of 2,947 different images that added up to 283GB and took over 111 hours to stich together. It's believed to be the world's largest picture taken indoors and the detail is incredible. Like the other "world largest photos" you can zoom in and out, pan around and find things you never saw on first glance. Jeffrey Martin, the photographer, literally took days to take all the pictures and considerably longer to process them all. This is a zoomed in view of the first picture. And there's still more to zoom in! 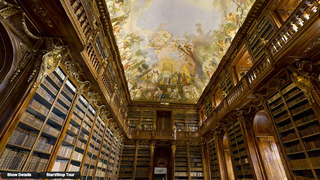 The beautiful ceiling of the Strahov Monastery Library. Jeffrey Martin used a Canon T2i (550D) controlled by a GigaPanBot to snap the photos, which took multiple days. Amazing detail in every snapshot. Such a wonderful picture of a wonderful place.